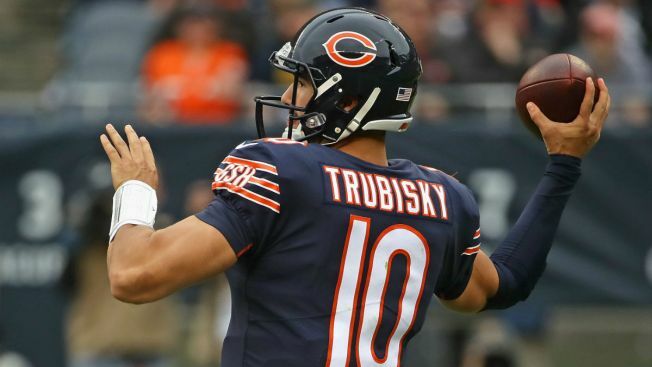 Chicago Bears quarterback Mitchell Trubisky will thrill fans when he runs onto the field Sunday for the team’s huge showdown with the Los Angeles Rams, and with the eyes of a national audience on him, he’s hoping to bring some exposure to a cause near to his heart. The Thumbs Up Mission, operated by the Keaton Franklin Coker Foundation, is designed to help “fortify families where a parent or child is fighting cancer,” according to the group’s website. The mission helps support a variety of programs, including retreats for families of those battling cancer. Keaton Coker was diagnosed with cancer when he was a high school football player, and passed away in 2014. Coker’s brother Kanler was best friends with Trubisky when the duo both played at the University of North Carolina, and over the last two seasons, Trubisky has honored the Coker Foundation during the “My Cause, My Cleats” campaign.